New paint throughout the rooms of your home will help to update the look of your space and offer a clean and polished appearance of the house. Home renovations are exciting projects to kick off the new year. However, there are a few things to consider before you get started! While the style and function of your next project are all important considerations, the potential for a high return on investment (ROI) is a crucial one to bear in mind. This point is especially important if you are planning to sell your home in the future. 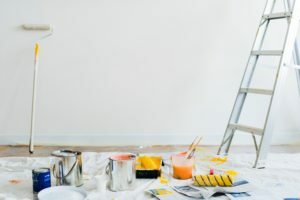 As you are determining which home renovation project will be best for your home in 2019, consider these five renovations with excellent ROI. The front door of your home is not only an important aspect of curb appeal, but it also contributes to the first impression of your home from a potential buyer. Investing in a new front door will help to add value to your home as part of its exterior aesthetic, as well as safety for new residents. Adding a new deck to your home is the perfect way to boost the potential for outdoor entertaining. A new deck could also become a major selling point for your home in the future. This new element of your outdoor space will be especially appealing to families who love to entertain guests throughout the year. A kitchen is an essential space in any home. By updating your appliances, floors, and even countertops, you can completely revamp the look and value of your kitchen space. Not only will you be able to enjoy a brand new kitchen in your home, but your kitchen will also be a significant selling point to a potential buyer as well. New windows are not only beautiful additions to any home, but they are also an element of energy efficiency in any season. Adding new windows to your home will help to keep cold air out during the winter, as well as cool air in during hot summer months. Potential buyers will appreciate this updated element that will help to keep their home comfortable and energy efficient. New paint throughout the rooms of your home will help to update the look of your space and offer a clean and polished appearance of the house. Fresh, neutral tones are especially ideal for putting your home on the market, as it gives your house the look of being completely new for potential buyers. This entry was posted on Friday, February 1st, 2019	at 3:41 pm	and is filed under Residential Sales	. You can follow any responses to this entry through the RSS 2.0	feed. Both comments and pings are currently closed.